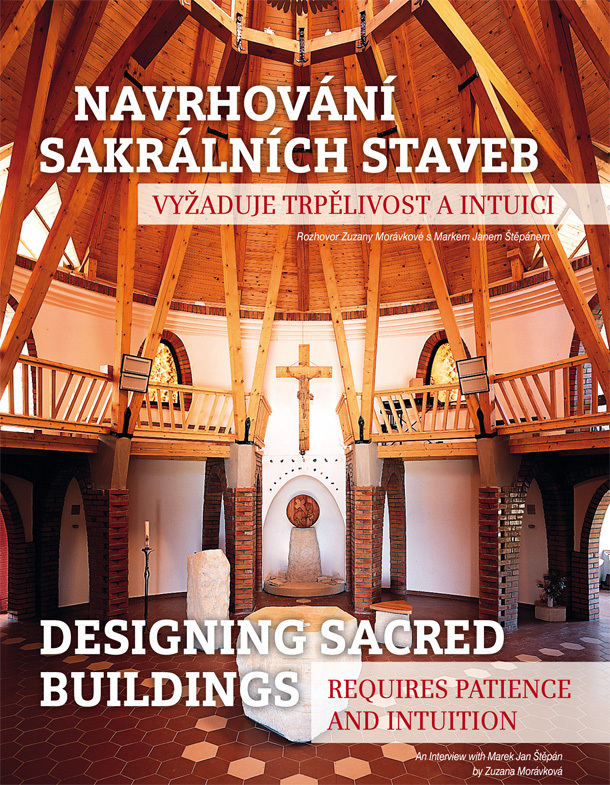 Marek Jan Štěoán is one of the very few architects in the Czech Republic with an intensive focus on sacred buildings. He frequently draws inspiration from traditional, almost archetypal ideals and his projects exude humbleness and harmony. He has also conceived “freedomek”, a concept of a free house: mobile, ecological and serially produced habitable container. 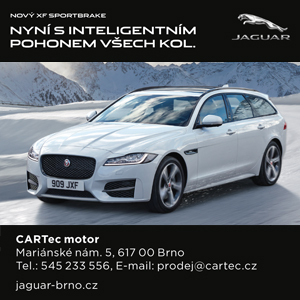 In the period of 2007–2012 he worked as an external consultant for architecture at Prague castle. Our conversation took place on a sunny October afternoon in his attic studio located in the dome of Tivoli, an Art Nouveau building at Konečného Square. Sacred buildings represent a substantial portion of your work. How did they become your focus? Probably because of my worldview – ever since my childhood I’ve felt close to this subject matter. And due to my patience because only a few architects have the stick-to-itiveness to work on sacred buildings. The reason is the incredible complexity of the church and sacred architecture itself. Does sacred architecture place any specifi c demands on the architect? I think the fact whether the architect is a believer or not does not play such a big role. A lot of good churches were designed by architects who were not Christians and, in contrast, I know bad churches designed by architects-believers. I don’t think one’s personal approach to faith impacts the quality of architecture. In your case, however, faith is an important part of you? What was your fi rst order to design a sacred building? 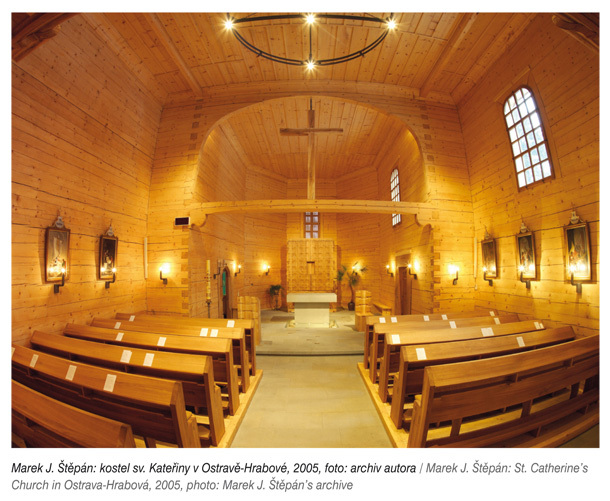 The first project was to design a church in Lesná which I prepared as part of my diploma thesis in 1991. The first construction that was actually built was a wayside shrine constructed in Pražmo in 1994. At that time, my friends and I organized visual art open-air events and decided to create something lasting and transcendental. So we used local stone to build a wayside shrine which was also an expression of thanks for my parents and ancestors. How does the process of designing sacred buildings differ from that involving profane structures? If you have the drive to create it doesn’t really matter whether you’re designing a church or a chair. The underlying principle is similar. The important thing is interest, trust and intuition. In the beginning of my career I relied upon some kind of reasonbased speculation, a rational justification of what a building was to look like. The older I get the more I trust my intuition. And also experience and feelings which I find inspiring most of all. 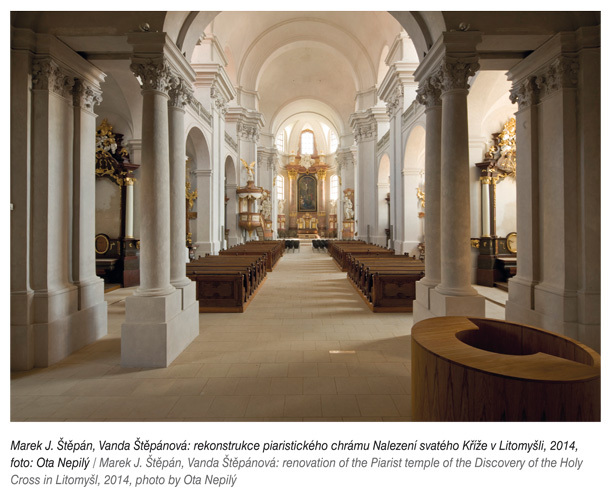 For instance, I think of the reconstruction of St. Catherine’s Church in Hrabová which was de stroyed by fire. When I went to see the location for the first time, it was freezing and there was snow on the ground. All that was left was the stone foundation and ever-present silence. It was such a strong experience for me that all of a sudden I began to perceive entirely different context which I can’t even begin to describe in words. How much freedom do architects have when designing sacred buildings and to what extent are they restricted by liturgical rules? 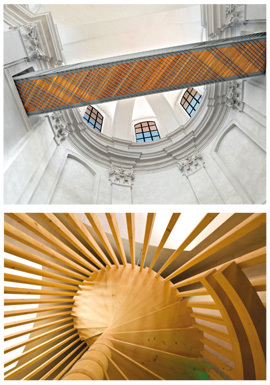 Old churches are usually subject to monument protection but projects for new structures provide architects with rather large amounts of creative freedom. 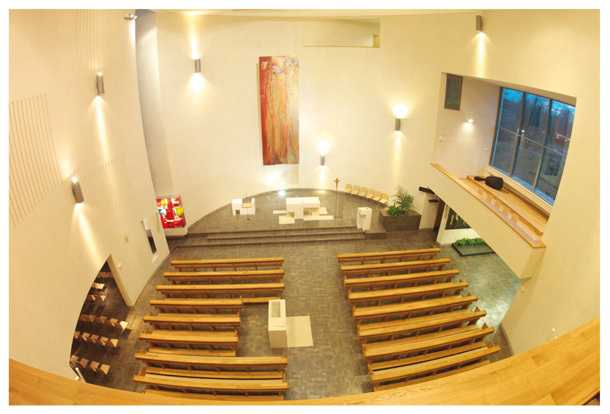 The architectonic symbolic and liturgical layout of a church play an important role, of course. They are, for instance, the location of the alter and placement of pews around it. 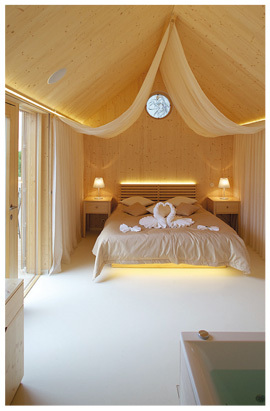 However, the most important thing is that the architect and the client – in this case the parish – find common grounds. Currently, a number of entirely different ideological streams as to what a church is supposed to look like exist. The final solution thus really depends upon the attitude taken by the specific parish. Is it then possible that a design which would be approved without major difficulties in one location would be unacceptable in another? What role does context play in designing a sacred building? It is important but definitely not crucial. For instance, compared to civil buildings, a church is such a meaningful structure that it can influence its surroundings in a certain manner. Your portfolio includes three newly constructed churches each of which is very different from the others – the wooden church of St. Spirit (sv. Ducha) in Staré Zubří, in the foothills of the Beskydy Mountains, the Roman-Catholic church of St. Spirit in Ostrava-Zábřeh and the church of St. Spirit in Šumná, nearby Znojmo. Could you describe these individual projects and the context of their origin? The church in Zubří is a very expressive structure – natural and organic. The design was significantly influenced by the Beskydy Mountains and the fact that I was much younger at that time and had a different view of architecture. 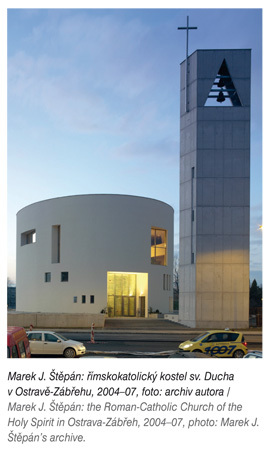 The Ostrava church is located within a housing development area amid blocks of flats. It was apparent that the church cannot compete with the housing development in terms of its size and so I used different means. I opted for an elliptical floor plan which is simple but very strong. I believe that people’s approach to sacred buildings should remain humble in this time which is saturated with various information and visual impressions. Does a certain degree of isolation from the external world play a role? Certainly. Visual contact with the surroundings which is desirable for family homes is, in contrast, undesirable for churches. And the church in Šumná? The church in Šumná has a simple form based upon old, early Christian structures closed off with an apsis which it modifies for the needs of current liturgy. However, it’s urban layout is very complicated and we’d spent a lot of time looking for its location. The solution selected defines, in a fresh and clear manner, the triangular shape of the village green. Your last project was a Piarist temple of the Discovery of the Holy Cross (Nalezení svatého Kříže) in Litomyšl. What is specific to this project? The church in Litomyšl is the only church I’ve worked on whose investor was not a denomination. It’s owned by the state and falls under the care of the National Heritage Institute. It hadn’t served its original purpose for 40 years, it burnt down several times and served as a warehouse and a parking area. Generally, it was in a very poor condition. The power of this devastated space was incredible. A discussion which ensued did not concern so much liturgy but the overall approach to this monument. The question was whether to conserve the structure in its Baroque form, which, however, had not been preserved, or to create a new form corresponding to the current needs. Baroque churches are characteristic for their rich interior decoration and adornment. The Litomyšl temple, in contrast, features a very moderate colour scheme. A footbridge inserted in the transept represents another very contemporary element. Was it difficult to put these solutions through? How important was the fact that the church would be used more as a multi-functional space than a place of sanctuary play? The grey colour scheme is symbolic and refers to the sad fate of the building. It’s a reminder of its history. I also think that it suits the church and lets light play the key role in changing the colour and mood of the space throughout the day. The dispute over the colour scheme was lengthy and academic but, in the end, we discovered grey colour present on a portion of the walling and that closed the case. Regarding the footbridge – it was installed based upon my inner conviction and also for its function. Preparations of an sacred art exhibition are underway and the footbridge connects two spaces. If it wasn’t there, you’d have to walk 12 metres down and then 12 metres up. It also plays a role in the exhibition itself by allowing for the transfer from the Old into the New Testament. Personally, I see the footbridge as a key to the entire church. Leaving out some elements in the load bearing structure resulted in an optical illusion in which slanted shadows casted by individual bars cross slanted sunrays. It makes you think about what exists and what doesn’t. 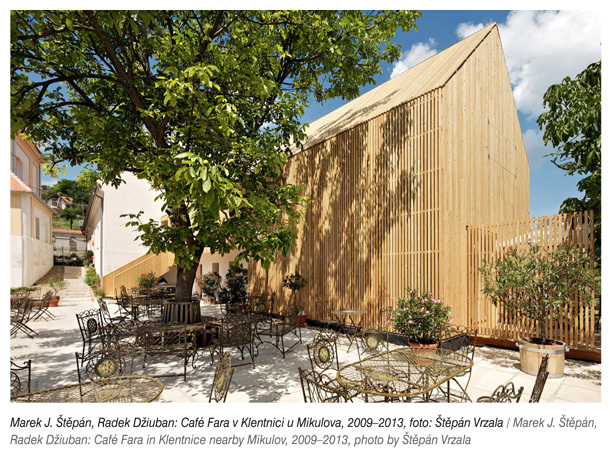 Café Fara in Klentnice nearby Mikulov is an interesting project balancing between sacred and profane architecture. The grounds featuring a cafe and a guesthouse nearby a church soon became a phenomenon attracting tourists from the entire country. What do you think stands behind the success of such a conception? Klentnice represents a significant confluence of the energy of the location, both the Pálava hills and the structure itself, a far-sighted investor and a good architect. Initially, there was a small café at an old rectory which the investor built for his father’s retirement. In three months, the place gained such popularity that its capacity was exhausted and since that time the grounds have been expanded to include a new guesthouse, a reconstructed building of an old school and modified sala terrena with a cellar. This year, a Café Museum was opened showcasing approximately twenty five beautiful old coffee machines from the 1950s and even earlier times. Currently, new opportunities for expansion are being considered. These, however, will take place outside the core grounds. In 2010, you and Jiří Brosch, a jeweller and jewel designer, carried out the Freedomek project based upon a conception of a minimalistic habitable container. Could you briefly introduce it? The Freedomek project is our joint effort. I dealt with its architecture more, of course, and Jirka put a team of people together and coordinated their work to breathe life into the project. 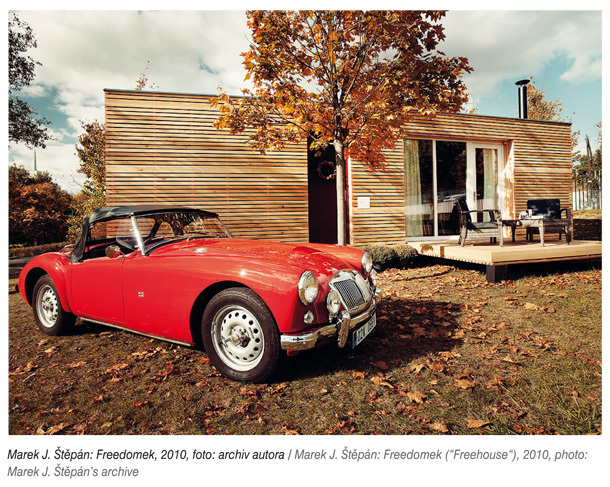 Freedomek is a small ecological wooden structure intended for dwelling. It’s a simple but effective recipe for having a home. In my mind I compare it to iPhone – the fact that individual ingredients or functions are somehow unique is not as important as the fact that their combination has been perfectly thought through, which is its key strength. Approximately thirty two Freedomek buildings have been constructed. There are five variants of its size and currently we’re working on a two-storey version. You use the word “ecological”. To what extent is your current work influenced by sustainability and ecology, topics which are being so frequently discussed, or, in other words, how have they been reflected in sacred buildings? Perhaps more than is apparent at first sight. I see ecology in the form of a structure conceived using common sense which doesn’t blindly follow marketing doctrines on innovation and environment friendly products. Do I need to heat two rooms or six? Do I need to heat to maintain twenty or twenty five degrees? These are questions we must ask ourselves because ecology is not only about materials but also about user modesty. If a building is well designed I prefer using fifty percent less heat insulation material and save the energy necessary for its production because in terms of costs such an investment does not return even in fifty years. Sacred buildings cannot be compared with housing but even their design must reflect how frequently they are used, how they are heated and to what temperature. We should think about these things. What are you working on at the moment? Is there any dream project or, in contrast, a project you’d never wish to take part in? After 23 years, once again, I’ve been working on the Lesná church project. In future I’d like to build a skyscraper, for instance...because it’s big. I wouldn’t like to design a brothel or a supermarket, a can outside the city, causing an outflow of people from the centre.